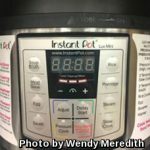 An Instant Pot Pressure Cooker is a small electronic multi-cooker appliance that can function as a pressure cooker, slow cooker, rice cooker, steamer, warmer, and more. It is often referred to as an Instant Pot. It is currently the hottest trend in home cooking. An Instant Pot Cooker can prepare just about any type of food you can imagine. Poultry, beef, and pork recipes, soups, stews, bread, and even desserts. Considering today’s fast paced lifestyle the Instant Pot is a time saving kitchen helper. Spend a few minutes preparing the recipe ingredients, program the Instant Pot and relax. The Instant Pot cooking method takes the stress out of long cooking times and of meal preparation. Instant Pot cookers are available in a variety of sizes, styles, and functions. 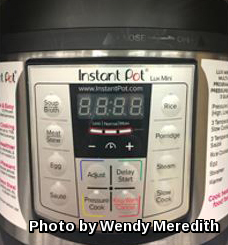 The function of an Instant Pot is based on the model purchased. Many brands are available. Basic functions present in most models consist of slow cooker, pressure canner, steamer, rice cooker, yogurt maker, egg cooker, sauté or browner, and warmer. When purchasing a multi-cooker consider the usage and quantity of food to be prepared. A 3-quart cooker is just the right size for single servings. Family sizes are available as 6-quart (4-6 servings) or 8 -quart (6-8 servings). The benefits of an Instant Pot cooker are numerous. No need for constant or frequent stirring, no worry about overcooking or burning, saves energy based on quick cooking times required for recipes and less small kitchen appliances needed for preparation. Traditionally beef stew and less tender cuts of meat take hours of cooking to render tender. The Instant Pot Cooker dishes up these delicious dishes in under an hour. Place beef in cooker. Add stock, water, bay leaves, peppercorns, and vinegar in cooker. Cook for 90 on meat/stew setting. Remove corned beef. Add vegetables; cook on high pressure for 4-5 minutes. *Follow directions listed on Instant Pot instruction manual for programming cooker. Instant Pot cooking is easy, economical and quick. Recipe adapted from Cooks’ Essentials.